Laguna Vista resident Dr. Terence Garrett, professor and chair of the Public Affairs and Security Studies Department at the University of Texas Rio Grande Valley (UTRGV) was one of three expert witnesses who provided testimony in a U.S. Senate subcommittee hearing on the topic of border fencing between the U.S. and Mexico. The hearing, held on April 4 in Washington D.C. by the U.S. Senate Committee on Homeland Security and Governmental Affairs, was chaired by Sen. Ron Johnson, (R-Wisconsin). Sen.Claire McCaskill, (D-Missouri), served as ranking member of the committee. David Aguilar, former acting commissioner of U.S. Customs and Border Protection, along with Ronald Colburn, former deputy chief of the U.S. Border Patrol, joined Garrett in providing testimony to the committee. 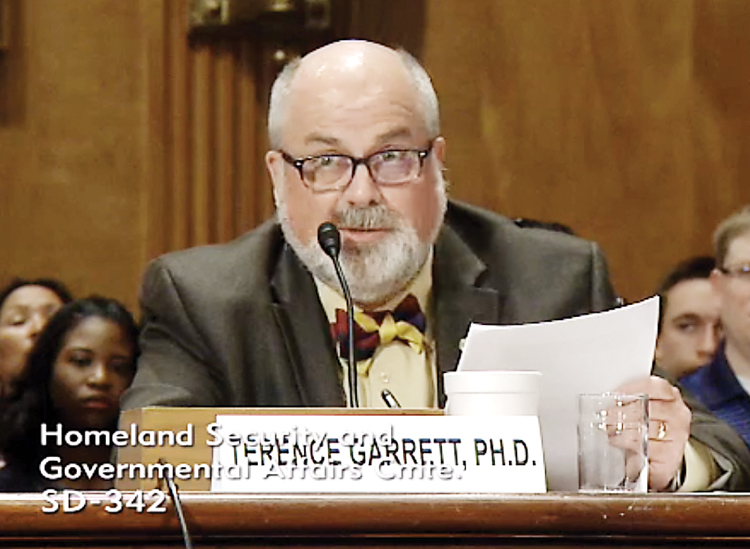 Garrett stated in the introduction of his written testimony that, “Walls have long been used as a solution to address public policy situations such as national security, economic security, and the prevention of an influx of migrants to cross into sovereign territory.